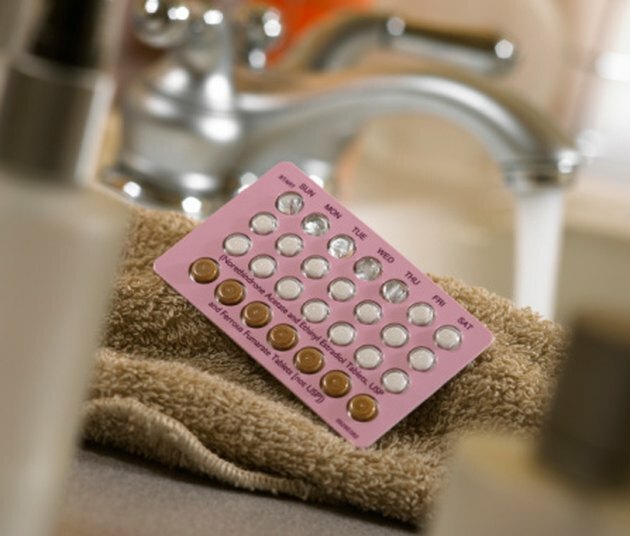 Birth control pills are a popular way for women to prevent an unwanted pregnancy. All types of birth control pills contain synthetic forms of the hormones estrogen and progesterone, though some pills may only contain one type of hormone. The hormones prevent pregnancy by suppressing ovulation and alter the uterine walls so the egg cannot implant. When taken every day at the same time, birth control pills are almost 100 percent effective in preventing pregnancy. Many different brands of birth control are on the market. Combination birth control pills are one type of birth control pill that contains both estrogen and progesterone; however, the hormone levels in each brand of combination birth control pills are not the same. According to the National Women's Health Resource Center, combination birth control pills are divided into three categories: monophasic, biphasic and triphasic. Monophasic combination birth control pills have 21 pills with equal amounts of hormones in each pill. Examples of monophasic combination birth control pills are Alesse, Brevicon, Demulen, Desogen, Levlen, Loestrin, Norinyl, Ortho-Cept, Ortho-Cyclin, Ortho-Novum, Yasmin and Yaz. However, Yaz contains different hormones (drospirenone and ethinyl estradiol) than other monophasic combination birth controls pills and contains 24 hormone pills. Biphasic combination birth control pills have pills with two different levels of hormones; for example, hormone levels may be higher the first 10 days, then lower the next 11 days. Ortho-Novum 10/11, Necon 10/11, Mircette and Jenest-28 are all biphasic combination birth control pills. Triphasic combination birth control pills, like Ortho-Novum 7/7/7, Ortho Tri-Cyclen, Tri-Levien, Tri-Norinyl and Triphasil, have pills with three different levels of hormones. Extended cycle birth control pills are another type of combination birth control pill; however, women who use extended cycle birth control pills do not have their period every month, according to the National Women's Health Information Center. Depending on the type of extended cycle birth control pill the woman chooses, she may only have her period four times a year, or even less. Brand name options for extended cycle birth control pills include Lybrel, Seasonale and Seasonique. Another type of birth control pill, the progesterone-only pill, contains only one type of hormone. Also called the mini-pill, the progesterone-only pill is ideal for women who want to take a birth control pill, but cannot take estrogen, according to the National Women's Health Information Center. Micronor, Nor-QD and Ovrette are progesterone-only birth control pill brands.